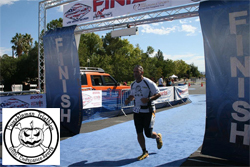 My name is Chad Soileau and this is my account of running my 19th triathlon of 2008 at the Pumpkinman Triathlon in Boulder City, Nevada. The Pumpkinman Triathlon is a ridiculously difficult Olympic distance race consisting of a 1500 meter swim, (approximately 1 mile) a 28 mile bike and a 6.2 mile run. This course would, hands down, turn out to be my most difficult race of the year. The site would also host the USAT Club National Championship Halfmax 70.3 race on the same course. My triathlon club, Baton Rouge Tri, made a strong showing with 16 athletes in attendance. We won the State Club Championship at Meat Pie a few weeks earlier and now were vying for some National hardware. Some of my fellow BR Tri members, a few who were multiple full course Ironman finishers, reinforced the fact that this race was on a level of difficulty that was up there with the full course, if not more difficult. What made this course hard? THE BIKE! Oh, how I, and pretty much everyone else, struggled on the bike. There were MULTIPLE, brutal , 8% grade hills that rolled over the beautiful, rustic scenery that surrounded Lake Mead and it's accompanying mountains. The final hill into T2 was a mammoth 8% grade hill that stretched on for close to 6 grueling miles! We had ridden that final hill in a car a couple times in the previous two days as we were sightseeing around the area and every time I got more and more anxious. It's hard to prepare for hills... err.... mountains like this in Louisiana. The sky was a deep purple as we arrived at the shore of Boulder Beach at Lake Mead Saturday morning. I was in awe of the sheer size of the transition area. Over 2000 athletes would be participating in the three simultaneous races (a sprint distance, an Olympic distance and a 70.3) today which caused the transition area, which stretched for over a quarter mile, to be much larger than what I am accustomed to. As I walked down to the water to prepare for my start I was pleasantly surprised to see none other than Sister Madonna Buder walking up the ramp. Sister Madonna is a Roman Catholic nun from Spokane, Washington and she's quite famous in the triathlon community. At the age of 76 she became the oldest woman to complete the Ironman Championship Series race in Hawaii. She has completed over 200 triathlons over the last 20 years including 13 full course Ironman races. Her story is quite amazing and it was a treat to meet her. She gave me a blessing and wished me the best for my race. She would go on to win her age group in the 70.3 race later that day. As I waded out into the cold waters of Lake Mead in the early morning hours to start the Pumpkinman Triathlon imagine my excitement when I see none other than Chris McCormack, 2007 Ironman Championship winner treading water 3 feet from me. I waded over to him, gave him a fist bump as we wished each other the best for the day ahead. Chris is the triathlon pro equivalent of Reggie Bush and he would be starting and participating in the exact same course at the exact same time that I was. Triathlon is the only sport in the world that allows a rank amateur like me to toe the line next to the best of the best. Well, needless to say, Mr. McCormack finished the race a few hours before I did, however it was a sobering thought to know that I was running in his footsteps the entire day. The race horn blew at 8AM sharp. I dove into the chilly waters and started my trek to the finish line. The water was clear and I could almost see the bottom of the lake the entire time. I had close to 200 athletes in my wave and I was right in the thick of things out to the first buoy. I drafted off a couple of faster swimmers for as long as I could maintain their pace but unfortunately I quickly fell back. The temperature was 68 - 70 degrees but my wetsuit blocked out most of the coldness. My exposed face, feet and hands were uncomfortable for the first couple hundred meters. After I passed the first buoy I settled into a good rhythm and before I knew it I was in the middle of the course with some dude in a canoe directing me on a perpendicular line back to the correct path of the course. I did this multiple times during the race and know I probably swam at least the 1.2 mile 70.3 distance because of my extremely poor sighting and open water navigating skills. I never struggled during the entire swim and never once did I feel anxious or concerned. I exited the water in just over 45 minutes, struggling to maintain my balance I shuffled into the largest transition area I'd ever been in. T1 had to be what felt like a half mile long. I was somewhere near the middle so I made sure to leave my sandals at the water's edge to protect my tender feet as I shuffled up to my swim to bike transition spot. I had lubed up my calves and ankles before I donned my wetsuit so it slipped off my legs with no problems. Similar to the Heart O' Dixie triathlon, T2 and the finish line were in a different locations. I had to stuff my wetsuit and swim gear in a bag that would be waiting for me at the finish line. That is, it would be waiting for me at the finish line if I could finish the bike. I clopped out to the mount line and quickly mounted my bike. I knew I was in trouble when I was struggling going up the baby incline that left Boulder Beach and T1. In the week leading up to Pumpkinman, my tri coach, Will Jones of 4th Dimension Fitness, fitted my bike with a different gear ratio hoping it would help me with the hills. I think it's a 27 / 11 or something but I could be wrong. I left T1 in my small ring up front and somewhere in the middle on the back wheel. For the entire bike course I went into my front big ring only once and that was going down a monster hill where I accelerated up to a whopping 46 mph. The rustic beauty of the surrounding mountains and the 'nothingness' of the desert surrounded me. The time passed slowly as I climbed hill after grueling hill. I just kept telling myself to keep pedaling knowing that if I stopped I wouldn't be able to start again and I would possibly even fall over since I was clipped in. The downhill stretches were surely fun but they never seemed to last long enough or generate enough momentum to pull me up the upcoming hill. The turnaround didn't come as quickly as it did in my prior races but it came soon enough. I knew that in a short 14 miles I would start my ascent up 'the hill' that led into T1. Challenging just isn't a good way to describe this hill. The 6 mile stretch up the final hill was just downright nasty. My usual bike average for races will range from 20 - 23 mph. For Pumpkinman my bike average would be 13 mph. I looked at my bike computer somewhere around the middle of the ascent and it was registering me going a whopping 3 mph. I kept spinning, keeping the thought in the back of my mind that if I stopped, I fall over. If that happened there would be no way I could gain enough momentum to start again. I surely didn't want to walk my bike up the incline as I saw quite a few racers were doing. I fought through the burning flames in my quads and calves and pushed myself like I've never pushed before on the bike. There were no breaks on this hill. The incline was steady all the way to the top but I finally reached the crest. T2 was literally feet from the top. I'd say it's kinda cruel to have to climb a hill like that and not receive any reward by getting to fly back down but unfortunately that was the case with Pumpkinman. No flying dismount for me today because I was simply to exhausted to attempt it. I squeezed my brake levers hard, flipped my legs over the bike and walked it my bike to run transition spot. Yeah, I walked. My legs were literally on FIRE and I had no choice but to walk. After racking my bike, slipping on my running shoes and my Team 464 jersey I slowly limped out of T2. I ran the first 2 miles, mostly because my gastric funhouse wasn't acting up yet. I passed the first port-o-joy at the mile 1 aid station and really should have stopped but I still had dreams of making it the entire race with no gastric distress. Maybe if I would have asked Sister Madonna to throw in a "no gastric distress" clause in her blessing I would have been protected. I barely made it to the port-o-joy at mile 2. Thoughts were going through my head about what I would say to the homeowner that walked out of their house, arms folded with a scowl on their face, as they watched me squatting in their bushes. The entire run passed through a residential neighborhood and had the 15 second warning come that's probably what would have happened. Needless to say, I made it to the bathroom and wasted over 20 minutes in "transition 3". Thankfully this would be my only bout with gastric distress for the day. I finished the race by walking a half mile then running two miles all the way to the finish line. The BR Tri guys at the finish line cheered me on as I shuffled under the arches. The race volunteer hung my Pumpkinman finishers medal around my neck as I smiled broadly, holding it up showing it to Beth. I had EARNED that medal! Pumpkinman was by far one of my worst performances. After factoring in the extremely difficult course I didn't feel so bad. There's really nothing I could have done to prepare for the monster hills. It was a treat to meet Sister Madona and Chris MacCormack, brave the sheer brutality and raw beauty of the course, and race with all the guys from Baton Rouge Tri. This race will definitely be one of my most memorable races of the year. Something about the "first ones" and "hard ones" make a lasting impression on one's memory so I'm sure that Pumpkinman will be in the forefront of my mind for quite some time. Thanks for reading my account of the Pumpkinman Triathlon. I hope you enjoyed reading it as much as I enjoyed writing (and living) it!